Balzer + Bray, 9780062198563, 32pp. 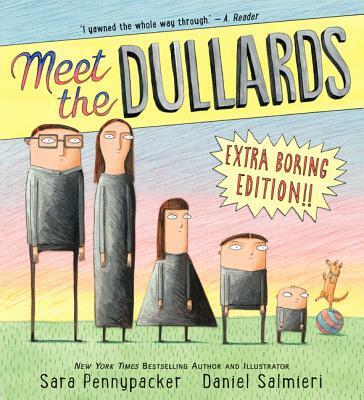 In the tradition of The Stupids, Meet the Dullards is a clever and irreverent picture book about a comically boring family, from bestselling author Sara Pennypacker and illustrator Daniel Salmieri. Their home is boring. Their food is plain. Their lives are monotonous. And Mr. and Mrs. Dullard like it that way. But their children—Blanda, Borely, and Little Dud—have other ideas. . . .
Never has dullness been so hilarious than in this deadpan, subversive tale. Daniel Salmieri was born in Brooklyn, New York. After that, nothing much else happened. Oh yeah—he did illustrate some books: Dragons Love Tacos, Secret Pizza Party, and Those Darn Squirrels!